South Africa's budget airline 1time has increased the number of flights available during the festive season to meet the customer demand in December. The airline is offering 52 additional flights on the George <> Johannesburg route, 32 more flights between Johannesburg and Port Elizabeth, 26 additional frequencies between Johannesburg and East London as well as 16 extra flights between Cape Town and East London. Meiringspoort, the first road to link the Central Karoo and the coast, is one of South Africa's most scenic drives. The 25km road, lined by spectacular rock formations and an incredible plant diversity, is winding along the gorge, crossing the Groot River no less than 25 times. The road is the perfect place to experience the Cape Fold Belt and its stunning beauty, but also keep a look out for birds, baboons and smaller wildlife abound in the protected kloofs and crevices. Halfway through the gorge you'll find an Information Kiosk where the history of Meiringspoort is displayed as well as samples of some of the different plant species growing in the area. Make sure that you take a walk up to the impressive waterfall hidden in the deep ravine. The water drops some 60 m into a deep pool. Entry to Meiringspoort is via Klaarstroom or De Rust. Klaarstroom is located 55km east of Prince Albert en route to Oudtshoorn and the coast, while it is about 80km to De Rust. update (28 Dec 2011): SSouth African Airways has revised its planned operational schedule for the new Johannesburg <> Beijing route, due to start from 31 Jan 2012. The new schedule results in operational day changes out of Beijing, which currently remains subject to Government Approval. Plan for 3 weekly Airbus A340-600 operation remains unchanged. South Africa's flag carrier, South African Airways, will launch a direct service between Johannesburg and Beijing in China. The inaugural flight is scheduled to depart on Tuesday 31 January 2012 from Johannesburg to arrive in Beijing, China,on Wednesday 01 February 2012. Introducing direct flights to Beijing is in line with SAA’s strategy to expand its network to Asia, the fastest growing market in the world. South African Airways will operate the route three times a week. The route will be served by the Airbus A340-600 aircraft, which have the capacity to operate the route directly all year round with no passenger payload restrictions. Flying time between Johannesburg and Beijing takes on average 15 hours. The elephants of the Mount Elgon region in Kenya are actually ordinary savannah elephants, but since hundreds or even thousands of years they have developed a unique pattern of behaviour unknown to any other elephant group in Africa. The elephants of the area, and not only them, but also buffaloes, antelope, leopards and hyenas, are coming to the "Kitum Cave", which is over 60 metres wide and penetrates 200 metres, to "lick" the natural salt found on the cave walls. Using their massive tusks elephants scrape the cave's walls, pull off chunks of it, crush them and finally lick up the salt. The Mount Elgon National Park is located on the border of Kenya and Uganda, about 140 km North East of Lake Victoria. The Kenyan side of the park covers 169 km² while the Ugandan part covers 1110km². Towards further enhancing the customer experience and ensuring on-time departures at Terminal 3 Dubai Airport, Emirates will be closing its check-in counters 60 minutes prior to a flight’s scheduled time of departure. Check-in counters are open at least three hours before the flight departure and will now close 60 minutes prior to departure from 1st December 2011. However, passengers are requested to report to the check-in counters no later than 90 minutes prior to departure, in keeping with the airline’s commitment towards greater efficiency and an enhanced travel experience. Customers who check-in with less than 60 minutes to their scheduled flight will not be accepted to board the aircraft, ensuring that passengers who have already checked-in and boarded will not be inconvenienced by delays and possible missed connections. Passengers who have opted for the online check-in facility with check-in baggage, are also required to check-in their luggage no later than 90 minutes prior to the scheduled departure of their flight. Passengers holding an eboarding pass and travelling with carry-on bags only, can proceed directly for security clearance. All passengers are requested to be at the boarding gate no later than 35 minutes before departure and boarding gates will close 15 minutes before departure time. Transit passengers from flights arriving late into Dubai will be escorted by airport staff through formalities to ensure they make their onward connections. The Namibian government has launched the Namibia protected landscape conservation area initiative (NAM-PLACE) in a ceremony held at the Safari Hotel Conference Center in Windhoek on 15 Nov 2011. NAM-PLACE is a five-year project funded by the Global Environment Facility (GEF) to an amount of US$ 4.5 million and is aimed at the establishment of the landscape conservations areas necessary for the conservation of country’s biodiversity as well as the stimulation of sustainable social and economic development. The proposed landscapes will ensure that land use practices are of areas adjacent to existing protected areas are compatible with biodiversity conservation. The project is implemented by the Ministry of Environment & Tourism (MET) in collaboration with the United Nations Development Programme (UNDP) as the implementation agency. The project intents to bring an additional 15,550 km² of land under protected landscapes management arrangements, designed to conserve biodiversity at a larger scale, rather than individual patches of land units. The project has five demonstration sites where this will be demonstrated and attained. Namibia currently has 20 state-run protected areas which account for 17% of the total land area, while communal conservancies cover over 17% of the land. Private land used for conservation represents slightly over 6% of the country's land surface. Namibia's Environment Minister, Netumbo Nandi-Ndaitwah, said in the keynote address held at the official inauguration of NAM-PLACE "[...] A growing demand to create more conservancies across the country is an indication of the Ministry’s Community-Based Natural Resource Management programme’s successes. Therefore Government, communities and private sector, in total have close to half of the country, an astonishing 42% earmarked for conservation. This is a remarkable achievement noting that the International Union for Conservation of Nature (IUCN) recommends that each country must set aside at least 15% of its total area for conservation purposes. [...]"
Ambitious plans, Namibia, but very good plans! The flag carrier airline of the Netherlands, KLM, will serve Lusaka in Zambia three times a week using an Airbus A330-200. The aircraft has space for 243 passengers, 30 in World Business Class and 213 in Economy Class. 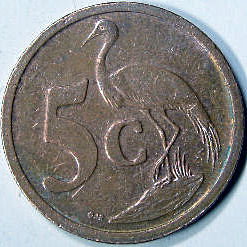 South Africa will no longer be making 5 cent coins, says Cabinet spokesperson Jimmy Manyi. Briefing the media on Thursday, Manyi said at its ordinary meeting on Wednesday that Cabinet had noted the discontinuation of the production of the South African 5 cent denomination coin. Further to this, the 10 cent denomination coin is to be replaced with a new 10 cent denomination coin with effect from April next year. "The new proposed 10 cent denomination coin will remain the same size. The metal content will change from the previous bronze-plated steel to copper-plated steel. This will result in the reduction in cost of producing these coins," said Manyi. The independent South African documentary un•earthed seeks to investigate plans of potential shale gas development and its method of hydraulic fracturing in the Karoo and broader regions. The project is committed to thorough, objective research and encouraging open and accurate discussion amidst heated debates currently unfolding in the country. After filming locally and abroad, un•earthed is currently in post-production and a massive release is expected in early 2012. Pls check the website of the documentary and their facebook page for more info! Qatar Airways, flag carrier of Qatar, will focus its 2012 route expansion programme on Australia, Africa, Europe and the Middle East with a raft of new international flight destinations set to join the airline’s global network. Operating from the its hub in Doha, capital of the State of Qatar, the airline will start operating flights to Zanzibar (Tanzania), Mombasa (Kenya) and Kigali in Rwanda, as well as to Perth in Western Australia, to the Finnish capital Helsinki, to Croatia’s capital city of Zagreb and to Gassim in the Kingdom of Saudi Arabia. Qatar Airways, one of the fastest growing airlines in the world, currently operates a modern fleet of 102 Airbus and Boeing aircraft to 109 key business and leisure destinations across Europe, Middle East, Africa, Asia Pacific, North America and South America from its Doha hub. Recently named Airline of the Year 2011 by global industry audit Skytrax, award-winning Qatar Airways will operate over 120 aircraft to more than 120 destinations worldwide by 2013. We featured quite a number of surf videos, as well as paragliding, rafting, bouldering videos in the blog, but actually never took a look at bodyboarding videos. Time to change it - check out Simon Beesley's video about bodyboarding at South Africa's West Coast somewhere close Namibia. Kudos to Simon, Wesley & Dre! Bodyboarding: West Coast Solitude from Simon Beesley on Vimeo. British Airways asked its Facebook followers in a recent poll where they want to go this winter and Cape Town came out as the fifth most popular destination. London and the Caribbean topped the poll - Britain’s capital came in first due to its great shopping and the Caribbean’s warmth and beauty secured it a close second place. As the weather chills, many respondents also suggested that ‘anywhere warm and sunny’ would be a winter winner with them. And perhaps unsurprisingly, visiting friends and family or returning home was a popular reason for people to travel in the winter season. Visitors who travel through the Kruger National Park (KNP) using its northern border gates, like Pafuri or Giriyondo, as ports of entry or exit through to the neighbouring countries such as Mozambique will be required to produce a valid overnight booking in either Kruger National Park or Limpopo National Park, effectively from 01 December 2011. To allow visitors who have already planned their holiday schedule in Mozambique but have not secured accommodation booking yet, an additional fee of R150 per person will be charged to allow one to travel via the Park; however one should still provide valid proof that no accommodation is available in either of the two National Parks and possess the required travel documents. This option will only be available for a period of six months, effectively from 01 December 2011. Essentially, without a confirmed booking and confirmation that all facilities are fully booked, such travellers will be refused admission and they would need to use other routes outside the Park leading to their destination. The new control measures were introduced to reduce and eventually eliminate the number of vehicles using the gates as a drive through basis only, which is having a negative impact on the park as well as on its regular visitors (heavy laden, un-roadworthy vehicles, speeding, road kills etc.). According to SANPark's HOD: Public Relations, William Mabasa, the routes for the border gates are classified as tourists roads only and do therefore not allow for any commercial traffic. SAA is the only airline that is flying between South Africa and Malawi. Malawi's national airline, Air Malawi, had to ground its Johannesburg flights because the lease agreement on the aircraft (Boeing 737-300) the airline has been using for those flights is expired. South Africa and Cape Town's beer heritage goes far back into the country's culture and history. This heritage is deepening, with interest in all things beer on the increase. Several micro-brewers and new players have entered the field with new brews that have sprung up in recent years. This has resulted in a rising culture of understanding, tasting and appreciation of beer. The Cape Town Festival of Beer, the largest of its kind in South Africa, is the first festival to bring people together to celebrate beer and the art of brewing. Approaching 100 brands of beer on exhibition, this is an event you should not miss out... in case you are in Cape Town between 25 - 27 November 2011! Public tickets are on sale for each of the three days at R60, with gates opening from 12H00 on Friday, Saturday and Sunday from 25 - 27 November. You can also buy entrance for more than one day and buy a 2 day (R100) or 3 day (R120) ticket to make sure you can return for more fun in the sun! For more info about the festival, accommodation in the area and more, pls click here! If you are in South Africa next April (05-09 April 2012), make sure that you are missing out the "Splashy Fen", the country's longest-running annual music festival. Held every Easter, this five-day event attracts thousands of people from around the country and abroad to a farm near Underberg in KwaZulu-Natal for what is regarded by many as the ultimate outdoor music experience. The winners of the 2011 Eat Out DStv Food Network Restaurant Awards and the Top 10 Restaurants 2011 have been announced. Restaurants are judged on food, service and ambience, as well as other aspects that make or break the eating out experience. Although I am not a big fan of dance music, I found the the following two part documentary actually quite interesting. Check it out and follow the guys from Pascal & Pearce, who are promoting their new album "Passport" through the films, around South Africa's dance scene and explore what Cape Town and Johannesburg are like... dancemusicwise! The first video of the two part 24min series is taking a look at the electronic/dance music scene of Cape Town. The second video of the series is focussed on the city of Johannesburg, its artists and the music scene. Kudos to Warwick Allan & team for the videos! Video: Another great G Adventures ad - "Africa"! Video: Awesome G Adventures ad - "Earth"
Fourth issue of "Safari" digimag out now!